This will be a short, but valuable post for those of you who already ride a scooter or motorcycle, or those seriously considering buying one. I wouldn't say the learning curve is steep. Scooters are relatively easy to operate since most, like the Vespa LX150, have automatic continuously variable transmissions. But riding any powered two-wheeler, whether it's a scooter or a motorcycle that can exceed 40 km/h, means having to come to terms with the laws of physics in ways that no other vehicle exposes you to. One of the challenges is learning that when you are in a left hand turn, you actually need to steer right. It's called counter-steering, and it's completely counter-intuitive. It's a really necessary skill, and it takes a combination of riding experience, knowledge and practice to get it right. 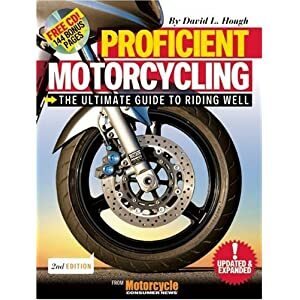 If you haven't already done so, you really need to find and purchase a copy of David Hough's Proficient Motorcycling: The Ultimate Guide to Riding Well. The knowledge you need to complement your riding experience and practice is contained in this book. After reading just a few chapters, I'm already more proficient in handling my Vespa. Being able to counter-steer effectively is making a huge difference in my riding experience.